Wow! Just when you thought you'd seen the last of the gorgeous, clear rose-pink blooms this beauty bestows, another round of flowers appears. From late spring to fall, your garden will be awash in the lovely roses of Nearly Wild. Blooms emerge from small, single, pointed buds that are as elegant as the fully open roses are lush. Perfect for cut-flower arrangements that can be enjoyed as a tableside accent or given as a gift to your favorite relative or cherished friend. 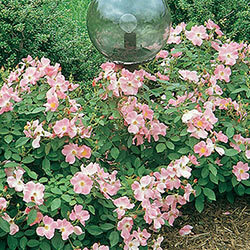 Unlike traditional roses, this shrub variety won't require any special care or maintenance to thrive. 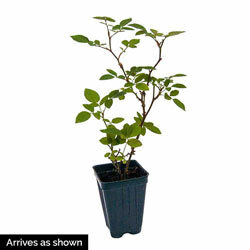 Simply plant in well-drained, humus-rich soil and give the plant a light prune only to remove dead or damaged branches. Flower Form: Single small tapered, pointed buds open to 5 petals. Soil Requirements: Humus rich, well drained soil that is slightly acid. Pruning: Only to remove any dead or damaged branches. Early spring after new growth starts. Prune with a slanting out to an outward facing bud. Winter Care: Mound up soil or mulch with preferred material. Remove in early spring.